Riverhounds goalkeeper Ryan Thompson returned to Pittsburgh on Thursday. What a summer it’s been for Ryan Thompson. After almost being gone for the most part of more than two months representing, and then getting a chance to play for his home country, Jamaica, in both the Copa America and CONCACAF Gold Cup tournaments, he returned to Highmark Stadium on Thursday and to his club, the Pittsburgh Riverhounds. 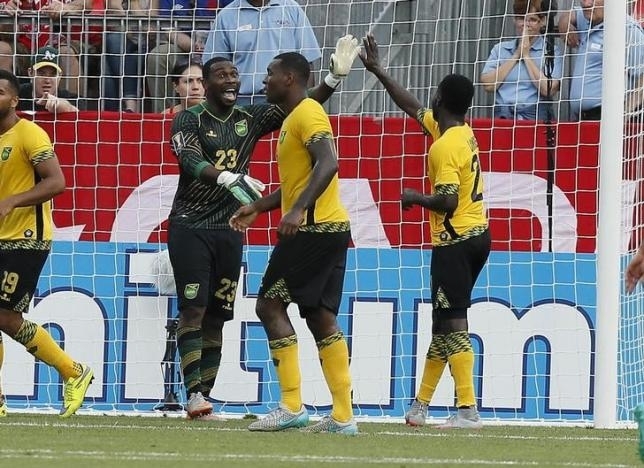 The Reggae Boyz finished second in the Gold Cup, as Thompson came off the bench in their final group stage match against El Salvador to replace injured teammate Dwayne Miller. 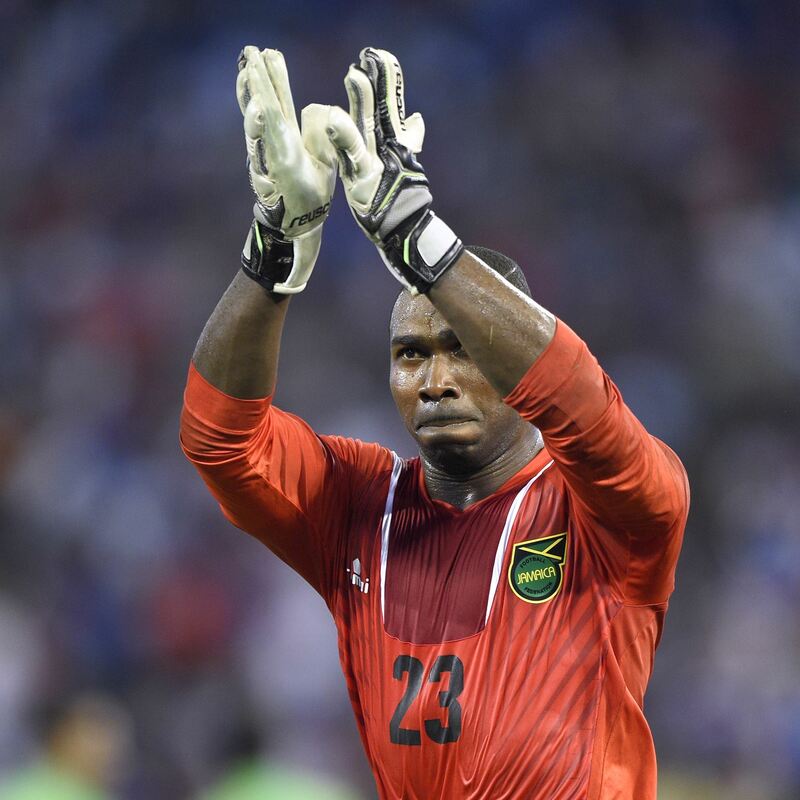 He then posted 1-0 shutout against Haiti in the quarterfinals and held off the United States 2-1 in the semifinals before finally losing 3-1 to Mexico in the Gold Cup Final on Sunday in Philadelphia. Meanwhile, the Riverhounds are in the midst of a three-game fall, having lost to Montreal, Louisville City — and in dramatic fashion on Sunday at Harrisburg. Thompson is eager to return to help his team. The Riverhounds next USL league match is Saturday night at Highmark Stadium against the Wilmington Hammerheads. The Riverhounds are certainly glad to have Thompson back. “Ryan’s always has a great spirit about him. And great attitude. And all our guys have that. But, to be able to have a guy like that come back, can help inject some of that into things is great,” said Josh Rife, Riverhounds assistant coach. “Obviously, the experience he had with the national team, you can’t replicate that. I think he’ll bring some of that experience and confidence back into this locker room as well. We haven’t had the results we wanted the last few games, hopefully it won’t be the only thing, but a factor that can slow down the momentum that’s been kind of going against us, and hopefully turn it in the opposite direction. I had an opportunity to catch up with Thompson on Thursday. Here are some excerpts from my interview. How did it feel when you were seeing the response and support from your fans here in Pittsburgh when you had finally got your chance to play in the Gold Cup? Having played in so many places around the world, what are your thoughts about Pittsburgh as a soccer city and the fans here. What was going through your mind, when you got called in to play in the game, in the 20th minute against Haiti? Can you share what it was like for the past couple of months to be a part of tournaments, and the competition against some of the best players, teams on the international stage? 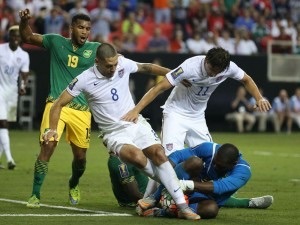 Riverhounds goalie, Ryan Thompson turned away the U.S. to help Jamaica upset CONCACAF’s defending Gold Cup champs. Now that you are back with the Riverhounds, how do you feel you can help the team as they are going through a tough stretch? The Riverhounds (7-8-1, 25 points) will face Wilmington Hammerheads (2-11-6, 12 points) on Saturday night at 7 p.m. at Highmark Stadium. Pittsburgh soccer legend Paul Child, who played for the Pittsburgh Spirit, will be honored on Saturday at halftime. This will be a special “Gold Out” occasion with the first 3,500 fans receiving a free Hounds T-shirt courtesy of Highmark. For a complete game preview, be sure to check www.PittsburghSoccerReport.com on Saturday morning.